Maybe it is time for President Trump to ask for the militia to help at our southern border. The larger the government gets the smaller the citizen becomes. The larger the Church becomes the smaller the Christian becomes. The larger the problem becomes the weaker the individual becomes. Americans no longer do anything for themselves. If you have a spiritual problem you run to the pastor. If you have an emotional problem you run to the shrink. If you have a physical malady you run to the physician. If you have a money problem you run to the bank. If you have a legal problem you run to the courts. No one takes care of their own problems. There is always some expert lurking out there who is ready and willing to take care of your problem for you… with a fee attached of course. It was rugged individualism that built this country. Back in the days when America was learning to walk people were trained to be self-sufficient. There wasn’t a lawn company to call to clear a forest. There was no grocery store on the corner where you could go buy some beef. There was no Uber stagecoach to get you to your local gym. If you wanted it done, you did it yourself. That included self-defense. Who do you call when there are no cops? 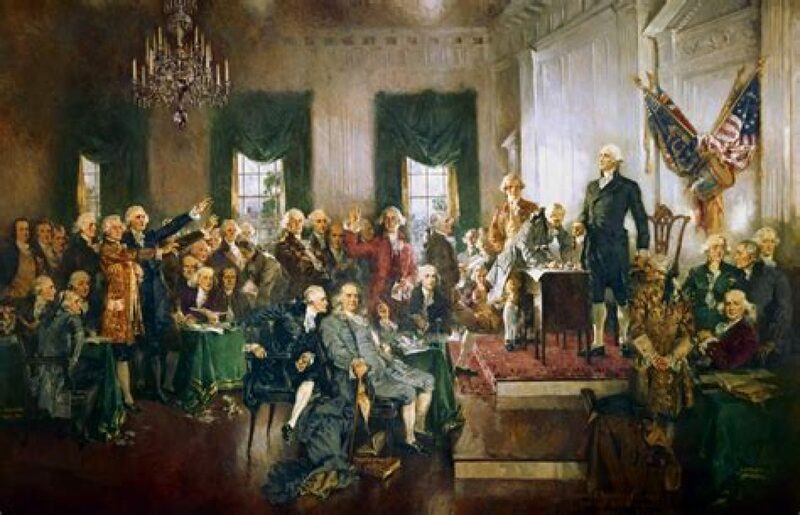 Our nation was built on a premise that was unheard of in all of human history… the idea that the individual was sovereign and that, apart from God, no individual or no organization had sway over the affairs of men. Each man was responsible for himself and his family. Americans were tougher then. Americans were self-reliant then. Americans were sovereign then. But with the advancement of ‘government,’ our responsibilities gradually began to erode. Are there even ‘volunteer’ fire departments in America today or has ‘firefighting’ become professionalized and swallowed up in the vast spectrum of ‘governmental services’ so prevalent today? Heck, parents don’t even raise their kids anymore. Childhood has been farmed out to day-care centers, public schools, and the dastardly Child Protective Services. Is there ANYTHING that Americans still do for themselves? Unfortunately, that is the same line of thinking that has given us ‘law enforcement’ and the rapidly-increasing cries to disarm average Americans so that government can do the job of protecting the citizens. Evidently, we are not capable of protecting ourselves. Womb to the tomb, government metastasizes into an all-encompassing Nanny State. ALL government tends towards evil; George Washington called it a ‘fearful master.’ The moment one yields responsibility and authority to the government, the individual citizen begins to shrivel. It is time for ‘we the people’ to reclaim our authority. The Second Amendment states, ‘A well regulated militia being NECESSARY for the security of a FREE state, the right of the people to KEEP and BEAR arms shall not be infringed.‘ Please tell me that you know that there was no ‘Federal Army’ when John Hancock and the boys declared independence from the taskmaster across the pond? The citizens were the military. Fighting for liberty wasn’t a job, it was a responsibility. The militia was made up of everyday citizens who bore the responsibility of defending the homeland. Federal armies were designed to fight foreign enemies. The Militia was in place to defend the community. Because American’s are no longer responsible for defending the home turf the government tells us that we have no need for guns. But we ARE responsible. We have simply shirked our duties. A well regulated militia being NECESSARY… who told us we were no longer necessary? The Constitution says we are. Our nation is under siege from a foreign enemy on domestic soil and the defense of this nation against the invasion is the purpose of the citizen militia. Like everything else, the Left has given the militia a bad name. The Constitution acknowledges the need for individuals to come to the defense of the nation. It is not only our right, it is our duty. President Trump, please declare an emergency and request the aid of the militia on the US border. God-fearing patriots will answer the call and report for duty. Literally millions of veterans, law enforcement, and Average Joe’s understand the problem. Station us on the border. Grant us permission to defend our nation against ALL ENEMIES FOREIGN AND DOMESTIC. If our borders are not secure we will soon lose our freedom. We may be a free state today but we will not be free for long. The President has the authority to call on the citizens. Read it here. Our national security is at stake. Call upon us Mr. President. Millions of us stand ready to report for duty. It would be an honor to serve. Here is a great video on the Constitutional Citizen Militia.